Paul urged Timothy to do his absolute best to communicate the Word of God accurately to his listeners. Handling God’s Word is no small task; we are to be diligent that what we are teaching, sharing, or communicating to others is the correct understanding and interpretation of the Word. As other Bible translations say, we are to rightly divide or rightly handle the Word of truth. I will be honest with you, for most of my Christian walk I did not do this. I am thankful for the Lord’s grace and mercy in this area of my life. Facebook often shows memories in my news feed of posts I shared through the years, and more times than not I cringe at what I previously posted. How could I so carelessly post and share anything that looked or sounded good? It didn’t matter if it was completely out of context or for that matter – absolutely unbiblical. It was laziness and negligence on my part to so easily misinterpret the Word of God. Sisters, rightly dividing the Word of truth is something we learn to do, it’s not a given once we are saved. We learn to study the Word properly and once we start interpreting scripture correctly, we will handle the Word correctly as we share with others around us. Misinterpreting the Word can lead us to sharing false teaching or unusual doctrine. 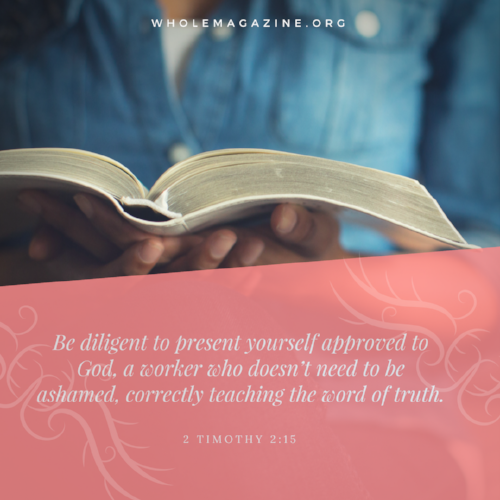 Believing the Word of God and putting into practice what the Holy Spirit has revealed to us through the Word requires careful study, wisdom, and accuracy. The Holy Spirit guides us into all truth. John 16:13. Sisters, let’s study the Word correctly, so we can share the Word correctly. Our listeners must hear the truth of the Word of God, not just a verse pulled out of context and misinterpreted because we were too lazy to rightly divide the Word of truth. Father, I repent for the times I have handled Your Words so careless. Handling the Word of God should bring a holy fear and trembling so as to convey it properly and correctly to those around me. Holy Spirit, guide me in the study of the Word and reveal the truth of it to me. I encourage all of us (even myself) to consistently seek the Lord and study the Word before mindlessly sharing on social media, teaching, or even uplifting those around us with scripture to be sure we are rightly handling the Word of God.